UNO faculty members are active musicians in our community. Our faculty ensembles perform throughout the year locally and internationally. Please visit our events page to see their concert schedule. The UNO Faculty Brass Quintet entertains audiences of all ages with their outstanding renditions of classical transcriptions, jazz standards, world music, pop tunes, and original works composed and arranged by members of the quintet. The addition of percussion allows the ensemble to traverse a colorful sonic palette sure to please the varied tastes of diverse audiences in educational school performances, summer park concerts, and formal concert hall presentations. 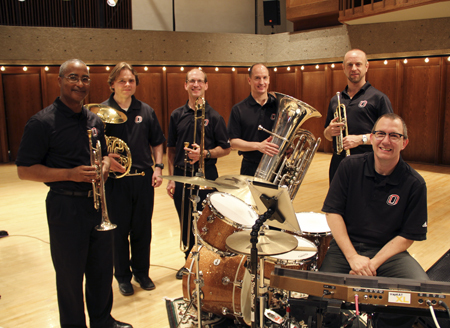 Members of the quintet perform regularly with the Omaha and Lincoln Symphonies, the United States Air Force Heartland of America Band, the Omaha Big Band, and the Nebraska Jazz Orchestra. The group knows how to walk down the middle of the road of brass quintet repertoire, but they are equally at home wandering the little-known byways or forging new paths in 21st century music. Known for their sense of humor, spontaneity, and improvisatory stage antics, the UNO Faculty Brass Quintet is: Barry Ford, trumpet (resident composer/arranger); Jason Johnson, trumpet (former member of the United States Navy Band); Sherly Hadeka, horn (Omaha Symphony); Pete Madsen, trombone (Omaha Big Band); Alex Serwatowski, tuba (United States Air Force Heartland of America Band); and Scott Shinbara, percussion. The UNO Faculty Jazz Combo entertains audiences of all ages and backgrounds through their performances of original compositions, renditions of popular tunes arranged by members of the ensemble, and unique interpretations of jazz standards. The UNO Jazz Faculty are some of the most in-demand professional musicians in Nebraska. Individual members perform regularly with the finest professional ensembles in the Midwest including the Omaha Big Band, the Nebraska Jazz Orchestra, and the Omaha Symphony. UNO Jazz Faculty members have backed up Wynton Marsalis, Aretha Franklin, Randy Brecker, Franki Valli, Marilyn Maye, and Wayne Bergeron to name only a few. The UNO Faculty Jazz Combo consists of Darren Pettit, saxophone; Jason Johnson, trumpet; Pete Madsen, trombone; Mark Misfeldt, piano; Brad Thomson, guitar; and Andy Hall, bass. 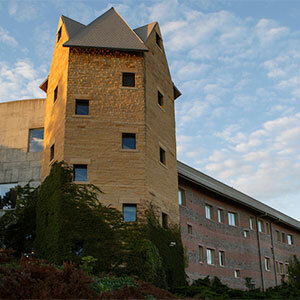 UNO's newly formed Maverick Ensemble brings together artist faculty to perform and conduct clinics throughout Nebraska. 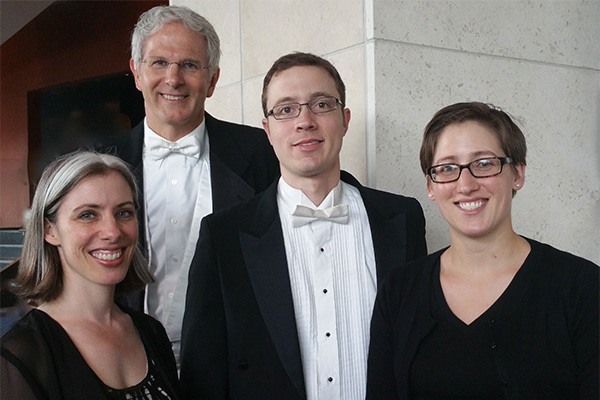 The core members, Mary Perkinson, Brian Sherwood, Greg Clinton, and Dani Meier, have well-established careers as soloists, chamber musicians, and orchestral musicians and have performed on both national and international stages. All four members perform with the Omaha Symphony, where Gregory Clinton and Brian Sherwood hold assistant principal positions. Additionally, its members have performed with the Cincinnati Symphony, Milwaukee Symphony, Skylight Opera Theater (WI), Wisconsin Chamber Orchestra, the Grand Teton Music Festival (WY), the Omaha Chamber Music Society, and the Token Creek Chamber Festival (WI). Members of UNO's Maverick Ensemble have also attended the Aspen, Banff, Brevard, Tanglewood, and the National Repertory Orchestra Festivals. During their inaugural 2014-2015 year, the group made over 30 visits to Nebraska high schools to perform, present, and conduct clinics. This year the ensemble begins its work with Partners in Performance, an award-winning program that brings together UNO students, Omaha Area Youth Orchestra students, and area high school students to impact the culture of leadership and community through mentoring, skill building, and relationships. Following two faculty performances last year, the Mavericks look forward to kicking off the fall semester with performances at Hastings College, the University of South Dakota, UNO, and UN-Kearney with the award-winning guest pianist Melody Ng, Assistant Professor at the University of Alabama-Huntsville. 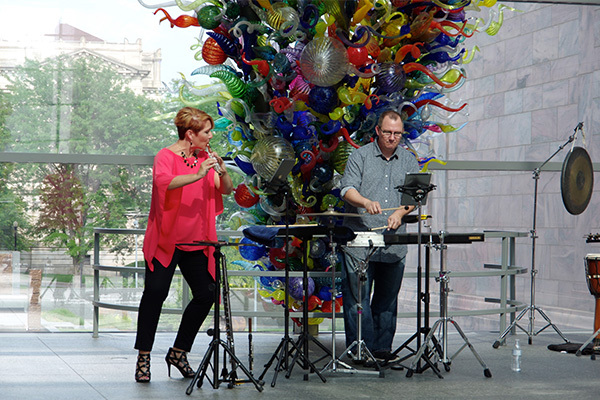 Zephyrus is a flute/percussion duo based in Omaha, NE comprised of Christine Beard and Tomm Roland, both of whom are active recitalists and share a passion for new music. Formed in 2010, Zephyrus has quickly gained national recognition as being a serious force for championing contemporary music for flute and percussion. In 2011 the duo was invited to perform at the highly acclaimed Festival of New American Music in Sacramento, CA where they premiered two new works written for them by American composers David Claman and Barry M. Ford. Selected as a winner in the 2011 College Music Society’s chamber ensembles competition, Zephyrus performed new works for flute/percussion at the 2012 CMS National Conference in CA. In 2012, the duo was awarded a prestigious FRI grant by the University of Nebraska at Omaha to assist them with their tour to South America where they were invited to give featured concerts at the World Flutes Festival IV in Mendoza, Argentina. Following a brief hiatius to puruse individual projects in 2014, Zephyrus returned to the stage during the Omaha Under the Radar contemporary music festival in June 2015. Currently, the duo is taking part in a commissioning consortium for a new work by Ivan Trevino for bass flute and marimba which will be completed in 2015, and Zephyrus is making plans for a 2nd tour to South America in 2016.